No new sensors, no new wire harnesses, no new radar, and no new cameras just the new and upcoming superfast ‘Tesla Computer’, retrofit it in Tesla vehicles with Hardware 2.5+ (vehicles manufactured since Aug 2017) and you’re on Autopilot Hardware 3.0 (AP HW3). Elon Musk clarified all the confusions and nullified all the rumors surrounding the next big thing in Tesla’s full self-driving ambition, the Autopilot HW3 — last year the Tesla CEO said that the swap between the Hardware 2.5 and HW3 computers is super easy. 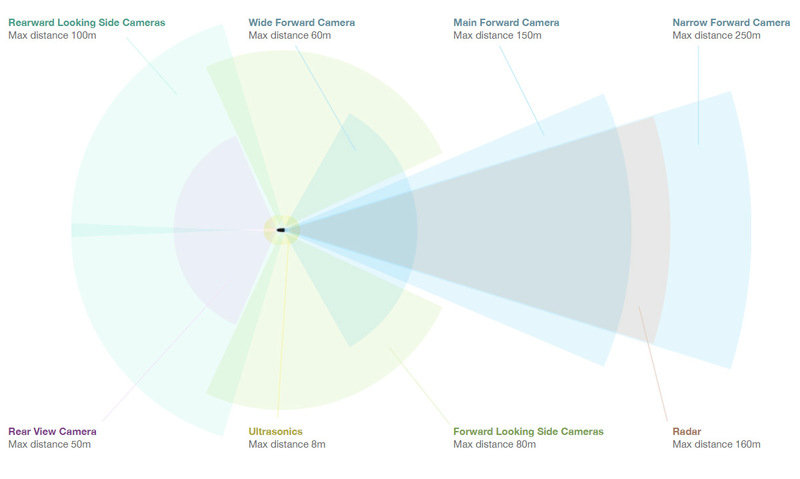 As per the above infographic, all Tesla vehicles with Hardware 2.5 that consists of 12 ultrasonic sensors, 8 cameras (3 front, 2 side repeaters, 2 rear sides, and 1 rear/reverse), and a front radar — this set of hardware is enough for full self-driving but the current Nvidia Drive PX2 GPU is not able to process the Tesla Vision as fast as it is required for FSD. The new Tesla Supercomputer will replace the Nvidia Drive PX2 — this retrofit according to Tesla/Elon Musk will increase the data processed and supplied to the Tesls’ Neural Network by 500% to 2000%. Tesla has been working on their custom AI Supercomputer chip for a long time and Musk has been talking about it time to time but this year seems to be the time that Tesla will actually start swapping their cars with the new processor/GPU. Rumor has that the new Tesla Model 3, Model S and Model X currently being produced at Tesla’s Fremont factory are already equipped with the new ‘Autopilot Hardware 3.0 Computer’ but let’s take this with a grain of salt — Elon Musk did not reply when asked this question, so it might be or it might be not. Let us know your thoughts in the comments section below. Don’t forget to follow us on Flipboard or Twitter for constant news and updates, we will be covering this topic in detail as the story unfolds.